Did you know that if you were baptized in a False name, you are NOT saved? We ALL (every race) have been lied to and have been conditioned by tradition. We often believe and do things that we don’t understand. No longer let our ignorance, arrogance, church, religion or traditions of men stop you from learning the truth! 20 Shall a man make ALaHiYM's unto himself, and they are no ALaHiYM'? When YaHuWaH graces a person to have their eyes opened to the truth and all emotion is put to the side, they can clearly see that from the beginning the ABaRiY forefathers inherited lies. These lies and taught miss interpretations (generational cures) continued on until YaHuWaH begin waking up His chosen elect which REFUSE to compromise swallowing down lies. Baptism is just another subject that has been totally taken WAY out of context. Babylon (the Christian Harlot Church) now uses it to further its own financial agenda and is leading the masses away from the truth! The English word translated word for water in the Greek is ὕδωρ or hydōr (G5204). What is interesting is that the first two Greek letters in the word ὕδωρ (ὕδ) is in the Greek word ὕδατος which is in YaHuWChaNaN 3:5. When you put that Greek word into a translator, here is what you get! Notice that when the Greek diacritics are changed you get two different words. When it has to diacritics (like in John 3:5) its the word blood, but when only one diacritic is used its the word water! Also the Greek word hydōr (G5204) says its root word is G5205 (which means "rain"). Further digging takes us back to the ABaRiY / Hebrew word גשם or GaShaM H1652 (to rain, to be rained on, to cause rain, send rain). 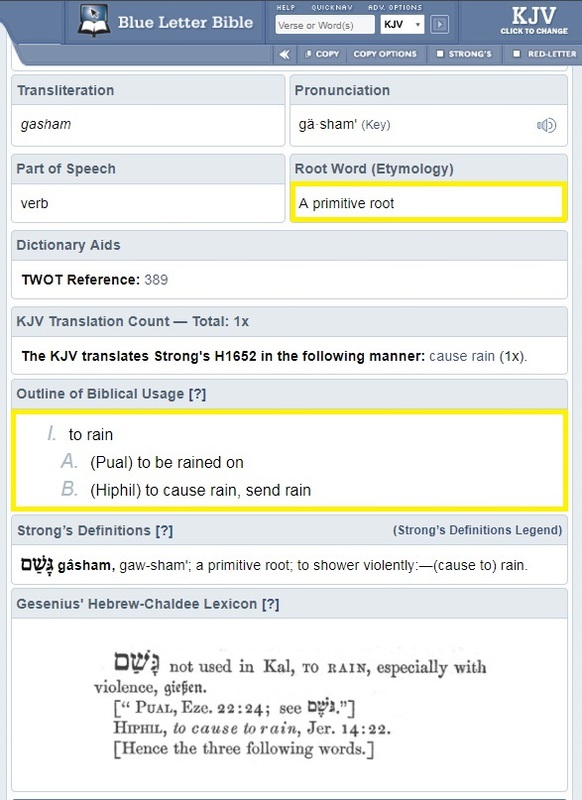 NOTICE that גשם or GaShaM (H1652) is a primitive root! So this teaches us that in YaHuWChaNaN 3:5 the word hydōr was used in the Greek which points back to the ABaRiY H1652 (which means to rain, to be rained on, to cause rain, send rain). With this new insight we now see how the English word water (or hydōr in Greek) was being used in YaHuWChaNaN 3:5. What its saying is that a person MUST be born again or have a rebirth by the raining down or showering of the blood / living water of the Ha'QaDaSh RuWaCh (the set apart spirit) of YaHuWShuWA that comes or is sent from above! It says NOTHING about having to get physically baptized / submerged under water. This is why people MUST use the RuWaCh for guidance and follow 2 Timothy 2:15, other wise they WILL perish for lack of knowledge. Sadly most pastors base their knowledge on the scriptures from the English translations, emotion and scholarly curriculum which ALL comes from the Babylon! When we look at the word "baptize" it takes us to the Greek. When we research and use the etymology for further clarification, some interesting meanings you find are "give a name to", "be over ones head" and "full immersion". How beautiful is it that when we come into the truth and receive Ha'QaDaSh RuWaCh we are also given a name (the true name of the savior YaHuWShuWA). We boldly say that anyone who gets / or got baptized in a harlot christian church, in ANY OTHER name besides the true name of YaHuWShuWA, they HAVE NOT been properly baptized in truth! Notice it makes a distinction from YaHuWChaNaN’s (john’s) baptism (one of repentance) and that of when YaHuWShuWA (aka translated to the Latin as Jesus in the English bibles) comes which rendered all previous water (the element) baptisms obsolete. Now if a person STILL wants to get baptized in physical water (as an outward show) along with the true names that’s fine, but physical elemental water is NOT a requirement. There are many accounts in scripture where a person was NOT physically dipped in water and they were favored. Once you do get the truth you will however want to be baptized in every way to overwrite what you did in the harlot church. Being washed or watered and being baptized in HaQaDaSh RuWaCh of YaHuWShuWA must come first. We read right in Strong's what that the TRUE meaning is for the Greek word baptism / baptizō (G907) and its root word baptō (G911). Very interesting that is says baptizō was a temporal dip while baptō was an act of dipping / immersion that produces a permanent change. 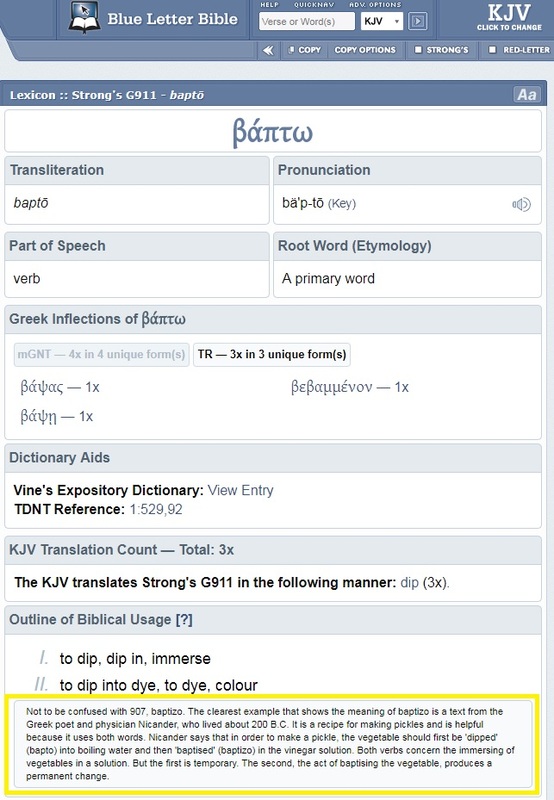 There is another Greek word for baptism and its βάπτισμα G908 and its also takes you back to G907. For those who are familiar with the story of Pentecost, the Strong's clears up any confusion. The scriptures says they were baptized that day, but it was NOT by physical water but by the washing of the living water Ha'QaDaSh RuWaCh! The baptism of YaHuWChaNaN (John) was temporal until YaHuWShuWA came along to permanently baptize (immerse or wash) with the Ha'QaDaSh RuWaCh which causes REAL change! The TRUE baptism comes from the washing of Ha'QaDaSh RuWaCh (the set apart spirit or in English they call it the "holy spirit or ghost"). So the next time a Christian or pastor tells you that you have to be baptized in physical water in order to be saved (Mark 16:16), ignore them. Once you begin peeling back the layers of lies, make the time to study, and ask the RuWaCh to guide you, then people will be able to see that at its core the pagan religion of Christianity is deception / confusion / BaBaL (H894). Pastors put mental chains on people and use fear tactics saying "you MUST be baptized in physical water and in the name Jesus in order to be saved", but research and scripture say otherwise. Noah (NuWaCh), Abraham (ABaRaHaM), Isaac (YaTChaK), Joseph (YaHuWSaPh), Enoch (ChaNuWK), Elijah (ALiYaHuW), etc., they ALL were NOT baptized (immersed) and yet the BaRaK (blessings or favor) was upon them by YaHuWaH. The lame man that YaHuWShuWA spoke with in YaHuWChaNaN 5 (John) said that he had no one to take him to the pool for healing, but right on the spot he received healing from the MaShiYaCh and was NOT dipped in physical water. Even when the lame man did mentioned the water in the pool, scripture reminds us that the RuWaCh troubled the waters for season, but once that season and RuWaCh was gone, that water had NO healing properties! YaHuWShuWA hung on the tree next to two thieves and because of one’s repentance, he saw paradise that day (NO dipping of physical water). What about the account recorded in Acts 16:26-34 where apostle ShauWL (Paul) was in prison. Scripture states that later that guard and his household was washed and baptized. NO WHERE in scripture does it say they were immersed in a pool or tub of physical water in the home, we KNOW the washing was of the RuWaCh of truth. We understand that being baptized in physical water, is just symbolic (or an outward show) for what has already taken place inside someone, but the harlot christian church does it backwards. Philippi is a hot destination for people coming to Greece on pilgrimage tours and cruises. In Philippi, ShauWL and Silas were imprisoned but a massive earthquake opened the prison’s doors and freed the Apostles. Because churches are in error, this is why for MOST that get baptized in physical water (and in the lie Jesus), their RuWaCh (spirit) remains the same and NEVER REALLY changes! When we make time to truly go deep in scripture, we learn that the physical water baptism was only for a period of time. When YaHuWChaNaN (John) was baptizing, the purpose was for repentance, and was sign or fore shadowing of the MaShiYaCh YaHuWShuWA. We also read in 1 Corinthians 1:17 apostle ShauWL (Paul) specifically said that the MaShiYaCh YaHuWShuWA didn't send him to baptize but to preach the truth / BaShuWRaH (H1309 gospel, good news, tidings, reward). So NOW we know that pastors or churches performing baptisms today is out of order unless they are sent by YaHuWaH to baptized in name of YaHuWShuWA. Scripture teaches us that those who baptized people in physical water were lead by YaHuWaH to do it, so was your pastor lead by YaHuWaH to baptize the congregation in the truth names or was it because of money, emotion or their "god" (which is just a title for many deities). The ONLY baptism one MUST receive (to be in right standing with the Creator YaHuWaH) is the "washing" of Ha'QaDaSh RuWaCh of YaHuWShuWA, and this is done ONLY by believing on and accepting the MaShiYaCh's true name! We have to use scripture, evidence and the RuWaCh to guide us into all truth. We understand that the body is fleshly and corrupt and that nothing corrupt enters into ShaMaH. If our filthy, fleshly and carnal bodies were so important, than why would we eventually leave this body (which returns to dust) to receive our true RuWaCh body in the end. The body is just a shell that houses the RuWaCh and in the beginning was created to live eternal, but once the sin of ADaM took place, the psychical bodies took on corruption and began to die! We know that physical water CAN NOT wash our RuWaCh and that ONLY things OF the RuWaCh can affect things IN the RuWaCh. Just like you can’t use a handgun to shoot a RuWaCh, physical water CAN NOT wash the RuWaCh. Just because you physically dip your body in water, DOES NOT cure or cleans its corruption, and does not your body still decay or get sick after the dipping? If being physically dipped in water was critical to ones salvation, then that would make what the MaShiYaCh said in YaHuWChaNaN 14:6 (John) a lie. Is it the water or the RuWaCh that causes the REAL change! Where do we read in scripture were YaHuWShuWA baptized the disciples in physical water! If baptism (full immersion) by physical water was REALLY a critical part of salvation, then where was the water when the thief who hung next to the MaShiYaCh and ShuWA’D (cried out H7769 the last part of the saviors name) unto him before entering PaRaDaS (H6508 meaning: "park, preserve, enclosed garden, forest")? What about the account were YaHuWShuWA descended to preach to the dead and baptized them, where was the psychical water (1 KaFa 3:18-22 "Peter")? If someone on their death bed receives YaHuWaH through His son YaHuWShuWA (which is the RuWaCh of truth) with a true and pure heart / mind, without being dipped in water, do they NOT get to enter ShaMaH (heaven)? 100% impossible for the saviors true name to have been "Jesus", what's the next thing the majority of pastors always say "His name doesn't matter, its ALL about your heart!" 19 a false witness who breathes out lies and one who sows discord among brothers. So what these pastors are telling people is that they can be baptized in ANY name, say "Bugs Bunny"
and be saved because its all about what they believe in THEIR heart! Who gave anyone the authority to change the name above all names (YaHuWShuWA) to another name (jesus) that is NOW under the name above all names? Once AGAIN pastors are adding to the word to make the masses feel better, instead of teaching them the TRUTH which causes REAL change! Adding to the YaHuWaH word is a detrimental violation! KhaZuWaN 22:18-19 "Revelation", Deuteronomy 4:2, 12:32 and YaShAiYaHuW 30:10 "Isaiah"
NO where in scripture does it state that salvation is given dependent on the intent or condition of ones heart. A desperate man steals food and money for his hungry children because he has no job and gets caught by the police. Do the authorities let that man go because the intent of his heart was to feed his kids? NO, he still has to do the time for the crime! Our question to ALL pastors is this "Show the world, were in scripture (chapter and verse) where is says "salvation is obtained by the intent of the heart or that's it ALL ABOUT our heart!" If what theses pastors are saying is true, then what their really saying is that the savior is a liar (Acts 4:12)! Its time to WAKE UP from the lies and deceptions in church, because your very soul is at stake! There's going to be a HUGE price to pay for those who willingly follow lairs, for those who willingly follow haters of truth and for those who reject the true names of the Heavenly Father and His son. Most of us have seen family and friends get baptized in "JESUS", but the result that's seen from these people is that for the MAJORITY, their same disobedient lifestyle remains after that. We ALL have personal experiences where people / family who claim to be Christians and were baptized in Jesus, STILL carry HATE in their heart, STILL willingly curse, STILL post up and "Like / Thumb Up" vulgar things on social media sites, STILL proudly continue shacking up with their boyfriend or girlfriend without being married, STILL proudly commit spiritual adultery on the Creator when the pagan holidays come around and boldly defend their actions, STILL dress like harlots out in public, STILL go to the clubs to meet fast women / men, joyfully travel to Vegas (SIN city) to specifically gamble and drink to get drunk, STILL refuse to reverence the true QaDaSh (set apart) names of the Father and His son, STILL hold on to / listen / sing and dance to sexually carnal music / lyrics, STILL compromise top please the masses, STILL continue to associate themselves with those who CARE LESS about living a lifestyle acceptable to the Creator and STILL refuse to even check to see if the truth / information is valid. All these actions (after a Babylonian, Christian style baptism) are a result that NO REAL change took place when getting baptized in a lie and NOT in the truth, Ha'QaDaSh RuWaCh of YaHuWShuWA. This proves whats really in a persons "HEART", people WANT what they WANT and NOT what the Creator wants! WHY would CHRISTIANS STILL act this way if they say they truly love the Creator, are filled with the so called "holy ghost" (QaDaSh RuWaCh) and was baptized in the power of the name above all names Jesus? Its because they have been baptized in a LIE, and there is NO power in the false name "Jesus"! The modern day CHURCH system is built on money, emotion, deception and sadly there's NO REAL growth in church. This undeniable FACT should enrage EVERYONE who truly loves the Creator, and say they are in a marriage and REAL intimate relationship with Him. When people make the time to do real research, the will find the FACTS, and FACTS hold more weight than feelings. FACTS should come first before emotion and if people get those two backwards, then they WILL make fatal choices regarding their soul based on their emotions. Elevation Church's flashy spontaneous baptism ceremonies, the new trend that's deceiving souls by the masses! Acts 2:38 records the Apostle KaFa's (Peter) words on the day of Pentecost, KaFa replied "Repent and be baptized, every one of you, in the name of YaHuWShuWA Ha'MaShiYaCh (Messiah) for the forgiveness of your sins. And you will receive the gift of the Ha'QaDaSh RuWaCh (the set apart spirit)". This was a strong affirmation by KaFa that “there is NO OTHER NAME under heaven given among men by which we must be saved” (Acts 4:12). Being baptized in the name of YaHuWShuWA indicates an understanding by the person being baptized that YaHuWShuWA is the Savior. In MaTaThiYaHuW 28:19 (Matthew) we are to Baptize in the name of the Father (YaHuWaH), His Son (YaHuWShuWA), and the Holy Spirit (the Ha'QaDaSh RuWaCh). We belong to the Father, are saved by the Son, and indwelt by the RuWaCh. This is similar to how we should pray, in the name of YaHuWShuWA (YaHuWChaNaN 14:13 "John"). If we pray in the name of YaHuWShuWA, we are praying with His authority and asking YaHuWaH the Father to act upon our prayers because we come in the name of His Son, YaHuWShuWA. Being baptized in the name of the Father, the Son, and Ha'QaDaSh RuWaCh, is being baptized in identification with them. This means that their power is over us and is in our lives. The HARD truth is that there is NO POWER in the false name "Jesus" because that name was never prophesied on the planet back in ancient times (The Letter J). A person can have faith in something the size of Texas, but if its based on a lie, they will NEVER get results. People claim they were changed when baptized (emotion driven), but when they are graced with the truth, THAT is the true test. We know that being outwardly baptized is just symbolic for the REAL change that already happened inside. For those who died NOT knowing the true name of the Heavenly Father or His son, was baptized in Jesus (or WASN'T baptized) and REALLY believed it was all true, only YaHuWShuWA can judge. But, for those in this day and age who HAVE heard this truth and STILL choose blow it off or eject it, their accountability standard will be held at a higher regard! For all those who say "So your telling me that everyone calling on the name Jesus is wrong and that everyone in the past that died calling on that name is going to the lake of fire?" or "My grandmother, grandfather and family members before me died in Jesus, so I'm going with what they taught me!" Listen to the this quick 4 minute excerpt from Apostle Bennett's teaching called "ShauWL - Hebrew of Hebrews" (from ShaulwmYaH), that question is clearly answered here. Sadly today's pagan, Babylonian, Christian churches have deceived people into thinking that what goes on in these abominable establishments is how the ancients did it back then, 100% FALSE! Today's modern day pagan, Babylonian churches have made a mockery of baptism and of YaHuWaH's truth! With pagan crosses on the stage, false worship in the air and mood lighting to set the tone, the deception is ready to lead the masses astray. Babylon plays on the emotion and ignorance of the people and zero's in on the FUN / Entertainment at Church. This non-scriptural spectacle causes people by the droves to come back SUNday after SUNday for the their weekly entertainment fix! Take away the emotion and theatrics of today's baptism services (the mood lighting / music, the elaborate stage decorations, the congregation cheering, and the choir singing), it would be just like the ancient times, intimate and NO hoopla. People are getting dipped into water expecting this miraculous change, but again its ONLY symbolic. The REAL change happens inside a person, prior to the baptism. When a persons thoughts and desires are NO LONGER driven by their own carnal heart or lower nature, but are NOW aligning with the true Creators (YaHuWaH's) heart desires, THIS is the true change. The living water or baptism of Ha'QaDaSh RuWaCh (the set apart spirit) causes people to naturally want to dig MORE deeply, go beyond the surface because and obey the Creator because they love YaHuWaH. ONLY when a person falls in love with YaHuWaH and they seek fervently after a MORE intimate relationship with Him (only accessible though the true RuWaCh washing of His son YaHuWShuWA), will they truly be baptized in the living water of the RuWaCh. This is something that CAN NOT be achieved by simply being dipped in physical water or received by an outward show. There is NO WAY that when a persons RuWaCh is truly changed and baptized by the washing of Ha'QaDaSh RuWaCh, that they will deny the truth when given to them. Remember their many different cunning and deceptive RuWaCh's (spirits) in this carnal world, and people can open themselves up to them. This why calling on the one true name of the savior YaHuWShuWA is critical, this is the only set part RuWaCh that can connect us with the Heavenly Father, and Creator YaHuWaH. Just because someone had a profound vision from the LORD / god (which are both titles so which LORD or gods do they mean? ), have gotten or is getting blessed with things by calling on the false name Jesus, DOESN'T mean its from YaHuWaH. We know the enemy can also BaRaK (bless or give favor) to people (scripture proves this), and we are reminded in scripture not to follow signs / wonders / experiences, but to believe on the true names and scripture! If visions, profound dreams or RuWaCh experiences happen without the having the true names of YaHuWaH or YaHuWShuWA, be very cautious! Those that DON'T have a TRUE love for the Creator, and were NOT really baptized in the set apart RuWaCh of YaHuWShuWA, their attitude is TOTALLY different. When called on the carpet to truly live for the word (YaHuWShuWA made flesh) and are shown the truth, they will distance themselves away from you and reject it because they were ONLY dipped in physical water (which causes NO real change) and NOT in the living water of the RuWaCh. For them, that same selfish, compromising spirit they had going into the natural water, remained when they came out (again its only symbolic). Essentially they went down dry (with a disobedient RuWaCh) and came back up wet (with the same disobedient RuWaCh). If the intent of ones heart is TRULY to change for the Creator and His Son, YaHuWaH will see it and they WILL then receive the set apart RuWaCh, and their actions (or the fruit of their tree) WILL show it (MaTaThiYaHuW 7:16-20 "Matthew")! For those who get or got baptized in their ignorance, YaHuWaH wink's at them (Acts 17:30-31) and will one day bring them a MaLaAK (messenger / representative) if they truly want to seek and know YaHuWaH, but it takes humility (H6031 ANaH "willing to be humiliated"). How does one know they have been washed by and or received Ha'QaDaSh RuWaCh (the set apart spirit) of YaHuWShuWA, boldness, confidence, separation from deceptions / lies and true love to stand / defend the truth (the names of YaHuWaH and YaHuWShuWA) becomes their passion (just like the apostles or anyone that YaHuWaH called to use)! This is a constant theme that all the patriarchs of YaHuWaH had in the ancient times. We know YaHuWaH is unchanging and that man has changed YaHuWaH's Hebrew / ABaRiY scriptures, so this trait still remains the same today (MaLAKiY 3:6 "Malachi" and ShaMuWTh 3:15 "Exodus"). Scripture records that every MaLaAK that YaHuWaH chose back then, KNEW His name, proclaimed it, some has His name in theirs, and they defended it! People forget that YaHuWaH was NEVER about the mass numbers, He is exclusive and is ALL about quality over quantity (scriptures support this). Most pastors KNOW they are baptizing families souls in a 100% proven false name (scripture says there is ONLY ONE NAME in which we MUST be saved by), but because pastors teach their congregations that the intent of their heart is ALL that matters, EVERYONE believes they are saved because His TRUE set apart name "DOESN'T MATTER"! 9 The HEART (H3824 LaBaB = mind) is deceitful above all things, and desperately wicked: who can know it? 10 I YHWH search the HEART (H3824 LaBaB = mind), I try the reins, even to give every man according to his ways, and according to the fruit of his doings. 8 The wise in HEART (H3824 LaBaB = mind) will receive commandments: but a prating fool shall fall. Again when people humble (H6031 ANaH "willing to be humiliated") themselves, put aside ALL the Babylonian, Christian church emotion and let YaHuWaH open their eyes to the truth, they will NO LONGER swallow down rotten and false doctrines. Sadly these corrupted sermons and flashy baptisms are served up on a platter of lies, and fed to the people by expired pastors who DON'T CARE to feed their congregation fresh, true and healthy food for their RuWaCh! Listen to these VERY eye opening teachings from Apostle Bennett and Micheal Rivera regarding baptism. Take your King James bibles, follow along, take notes and then go ask YOUR pastor why is he STILL continuing to baptize peoples, let alone in a false blasphemous name that has NO POWER to save! WARNING: A MESSAGE OF FIRE AHEAD! The following teachings are HOT, will offend and will burn those who don't have a pure heart for the truth and knowledge!